The Digital Convergence Lab provides a place to explore and make connections with experts and partners, locate equipment and facilities, and identify potential external resources for exciting new projects. We are currently working on a variety of research projects in virtual worlds, laser technology, game development with kids, mobile applications for iPhone, social networks, and multi-touch systems. The Digital Convergence Lab is supported by professional staff and partners working together with faculty, staff and students to achieve common goals for NIU. The Lab supports experiential learning projects that allow teams of students to harness new technologies for real clients in the for-profit as well as the non-profit sectors. One of the goals of the Digital Convergence Lab is to provide a centralized lab and professional expert staff to support faculty, staff, and students in the investigation, design, development, and research of digital and interactive media for education. In order to attain this goal, the DCL will develop new products, conduct and support faculty and graduate student research, and assess new media and technologies for purposes of education and communication. NIU faculty and staff are invited to contribute their ideas, enthusiasm, and expertise by affiliating with the Digital Convergence Lab by becoming a partner, participating in shared research, or presenting at a workshop. Contact Aline Click at aclick@niu.edu to find out how we can help you with your research, grant, or development. NIU’s Department of Special and Early Education and the eLearning Services Digital Convergence Lab have secured a federal grant to develop an online training tool to meet the needs of teachers of students with visual impairments nationwide. The Office of Special Education and Rehabilitation Services awarded the five-year, $500,000 grant in September. 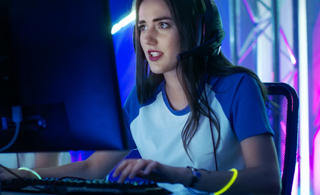 The purpose of this study is to examine female middle school students' experiences within a summer camp focused on video game design and development. This topic is important to explore because the number of women in technology-related careers has been declining over the last 25 years. 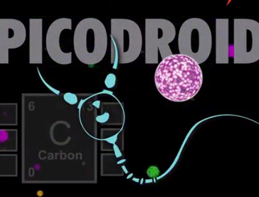 Two teams of NIU students, subject matter experts, and coaches designed and developed a video game using the Microsoft's XBox 360 Kinect interface technology to engage middle and high-school students in fundamentals of physics and chemistry using their bodies rather than a game controller to navigate through a world filled with subatomic particles while they build elements. Thanks to a grant from the Friends of the NIU Libraries’ Awards Program, Founders Memorial Library, in partnership with the Digital Convergence Lab (FO 340) is piloting Interactive Window Displays, the first on NIU’s campus! 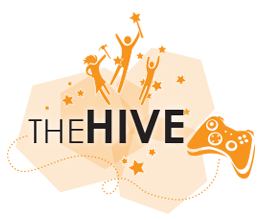 This project is to engage students of the digital generation in critically responding to social issues through highly interactive virtual environments (HIVEs): virtual worlds and computer/online games. 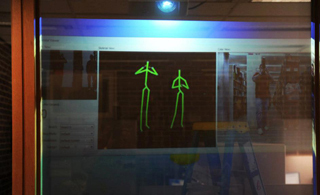 Through creating, role-playing, and collaborating in HIVEs, students in Schaumburg High School used the HIVE to explore their identities in their participating communities by designing avatar appearances, and creating virtual art that addresses social issues.